With an unprecedented look at the extraordinary flowers of Sonoran Desert cacti, this unique book combines natural history and art in ways that evoke both an intellectual and an aesthetic reaction in the reader. The book radiates through its art and illuminates through its words, inspiring a deep response to an often-unnoticed beauty in the desert. 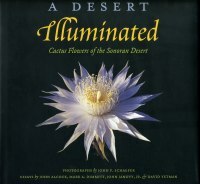 Each page is filled with the elegant, renowned, and detailed photographs of Dr. John Schaefer's beloved cactus flowers. The stunning close-up photographs are wrapped in the visual and contextual embrace of a Renaissance era illuminated manuscript that anchors the volume to humankind's longstanding passion for science and art. Four well-known biologists further illuminate the photographs in this book with very personal essays. John P. Schaefer is President Emeritus of the University of Arizona, where he taught and researched for 21 years, and where he helped establish the Center for Creative Photography. A conservationist and bird-watcher, he also enjoys a reputation as a skilled photographer. His work has been featured in Arizona Highways and many other publications, and he is the author of three books on photographic techniques.